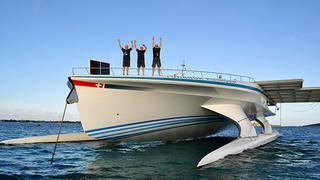 The solar-powered, 31m multihull superyacht MS Tûranor PlanetSolar has broken its own speed record for a solar-powered transatlantic crossing. During her 2010 to 2012 round-the-world journey, the solar-powered yacht crossed the Atlantic in 26 days, making it into the Guinness Book of World Records. Traveling 2,867 miles at an average speed of 5.3 knots, now MS Tûranor PlanetSolar has bested her own time by completing a transatlantic crossing in 22 days, 12 hours and 32 minutes, transiting from Las Palmas, Spain, to Marigot, St. Martin, in the French West Indies. After staying in Fort Louis Marina in St. Martin until May 22, MS Tûranor PlanetSolar will set a course for Miami, Florida, where she will begin work on the PlanetSolar DeepWater scientific expedition along the Gulf Stream ocean current. Professor Martin Benistor, climatologist and director of the Institute of Environmental Sciences at the University of Geneva, will lead a team on board the solar-powered cat while she sails along the Gulf Stream, collecting physical and biological air and water measurements in order to determine climate regulation, with a focus on atmospheric aerosols and phytoplankton. The 2013 campaign and research is funded by the University of Geneva and additional sponsors.